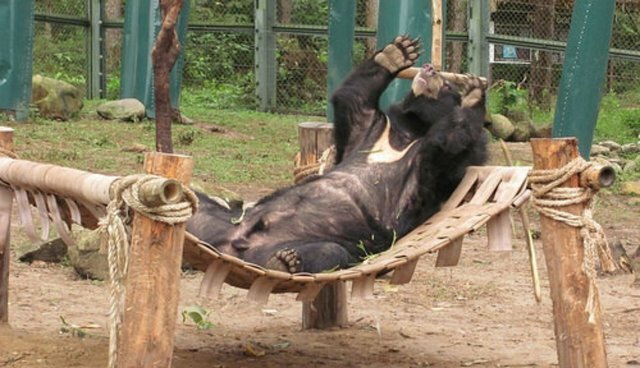 The behavior of moon bears at Animals Asia's sanctuaries is constantly monitored. It's laborious but vital work that helps staff understand the needs of the bears – and ultimately improve their welfare. Understanding the behavior is a specialized skill and a learning process that never ends. This recent footage of Jigsaw taken at our Vietnam sanctuary is a great example. As Jigsaw scrapes at the grass and rolls around, the untrained observer is left with only questions: what is the purpose of Jigsaw's behavior? Is he building a nest? Is he itchy? Is he playing? Is he agitated? Luckily, to experienced experts it all makes perfect sense. Some bears do pull up the grass and bring it inside the den to build nests, but that wasn't the case here. This didn't surprise our observers, as nesting is more common in females. At this time of year with little rain, the grass gets a lot drier. We've noticed that a lot of the bears enjoy pulling and rolling in the grass at this time – probably because it gives a more tactile sensation than other seasons. "Lotus made a real show of the same behavior recently, and the open mouth – seen in both bears – lets us know that this is entirely playful happy and positive." Thanks to the experience built up over years of monitoring bear behavior, we can be sure that bears like Lotus and Jigsaw are just having a good time.